What is a Dumpster ? Simply put, a dumpster is a steel container that is typically used for garbage disposal, recycling or junk removal. 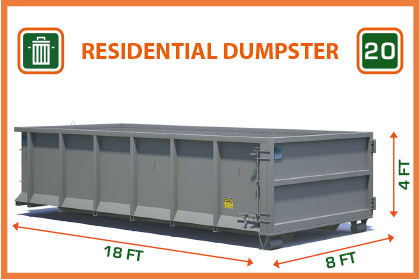 They vary in size from 2 cubic yards for front load garbage dumpsters and go up to 50 cubic yards for roll off dumpster rentals. Synonyms include bin, container, skip, trash bin, waste bin, garbage bin, disposal bin and disposal dumpster. WHAT TYPES OF DUMPSTERS ARE THERE? There are two kinds of dumpsters for business. The first is front loading styles that you see as a permanent fixture outside shops, restaurants, and hotels. These dumpsters have lids and locks and are picked up by special trucks that simply tip the bins overhead and empty their contents on site. These are front loading dumpsters and are a great option for businesses. 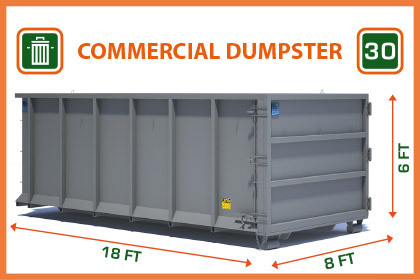 These large waste dumpsters are often used on construction projects including high rises, condominiums and townhouse complexes. A residential container is a generic term for a steel container that you put garbage, waste, trash or household junk into it. Dumpsters come in many sizes. These open top steel containers are typically delivered by a roll off truck. The lift system on the truck can both slide the dumpster off the truck and pick it up back up when its full. There is no damage to your driveway or alleyway as dumpsters have castors that are used to roll safely and without scraping or sliding. The other type of business containers are open top containers. These steel containers are larger than the residential dumpsters and delivered by similar rolloff trucks. There is a rear door in these bins to access and often ladders on either side to climb up on the side. Give us a call and tell us your city, type of trash and bin size. The disposal dumpster is delivered to your home or business on-time. Take your time to fill the garbage-dumpster with junk, waste, soil, concrete or garbage. Call us to pick up the dumpster-bin and we will come and get it. 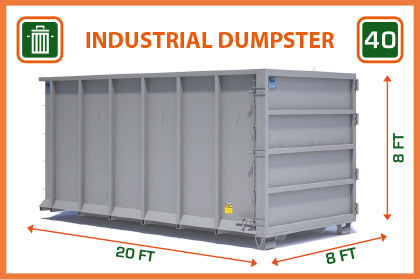 There are a few different kinds of industry dumpsters and often sites will have each type located somewhere in the facility. The first type are trash compactors. These are just specialized dumpsters with a motorized system that compresses materials inside the dumpster. These are used for garbage and trash as well as cardboard and recyclables. The benefit to this type of waste management plan is that it can be emptied less frequently and hold more per dump. Industry often creates waste of source materials from everyday operations. For example, a manufacturer often has incredible amounts of cardboard coming through its shipping and receiving bays. This corrugated cardboard is a commodity and holds value that follows the price of oil, steel and resources. Sometimes a bin rental company can offer a recycling dumpster rental for free or even pay the company for the contents of the container. Scrap metals are often the most common for this, as steel, aluminum, copper, tungsten, tin, stainless steel and other metallic and non-metallics hold lots of value. A roll off container can hold thousands of dollars of scrap if the metals are dense and the market price is right. Often, several commercial bins will be on site and get emptied once a week each or more depending on the garbage that is produced by the site. There is very little difference between a commercial disposal-dumspter and this type of industrial container. Sometimes, industry put lids on them to keep the contents from being sifted through by people or animals. Often, these can be owned by the manufacturing company or industrial site and they only sub contract the trucking of the dumpster to dump and return. Trash King is a rentals company that offers opentop dumpsters to rent for homes, businesses and industry. We have an inventory of garbage dumpsters with sizes perfect for residential projects, commercial projects or industrial dumpster services. Our disposal services include waste dumpster rental that is a cut above the competition. We have a sameday delivery promise if you call before 10am and we divert thousands of tons of garbage from the landfill each year. We are also licensed, insured and bonded and ready for your next residential waste, commercial wastes or industrial waste dumpster rental so call today. Sizes for these commercial containers range from about 2 cubic yards to 10 cubic yards. Since the garbage that goes into these containers often includes perishables and organics, it doesn’t make sense to have larger dumpsters because they need to be emptied more frequently to keep the smells and decomposition down. Typically, businesses would set up a pick up schedule like Monday and Thursday every week and would be charged a fixed price per month for this commercial dumpster service. There are several disposal bin sizes for a homeowner to rent and roughly 7 cubic yards to 20 cubic yards in size. A cubic yard is about 1.3 cubic meters or three feet tall by three feet wide by three feet wide. We recommend 20 cubic yard dumpsters for most home projects. They take up less space on your driveway than larger options. When you talk with our customer service team, they can help you decide what size is best for your project for cost efficiency and practicality. Tip #1: Make certain the rental of your dumpster is central to your renovation project planning. If you leave the rental of the dumpster to the last minute, you’ll run into several problems; first among these being, you may forget to book your dumpster rental until after the renovation has started. Unless you have a dumpster on-site at your location before renovation begins, you may find garbage and material starting to pile up in various areas on location. For safety and a timely disposal of materials and trash, call Trash King the moment you know you have a project on the horizon. Their drivers can even deliver same day if you call before 10 in the morning! ...s1">Tip #2: Assess your project to determine how much waste there will be. While this may sound easier said than done, it’s good to know Trash King’s specialists are always just a phone call away to discuss your project. They’ve been renting bins to the community for a long time and have developed the expertise necessary to help their clients save money by renting the precise size of bin for the job. Speak with a specialist now by calling our dumpster team and they’ll be happy to help. Tip #4: Visit the TrashKing.ca website and click on the ‘Our Bins’ link to see specifics on their bins. Sizes include 8, 10, 12, 15, 20, 30 and 40 cubic yard bins, so you will not have to rent a dumpster that’s too large for the job at hand and pay for space you won’t use. Trash king rents mini bins that are the perfect size for smaller household bathroom and kitchen renovations, small basement or garage close-outs and such. Feel free to contact the company to talk about your needs.